Urgot has always been one of the odd champions out in League of Legends. While some champions are bold and others are beautiful, Urgot is... well, he’s a stitched together carcass marching around on spider legs. As the years have marched by, Urgot’s four spider legs have been struggling to keep up. Despite some occasional play in the mid lane by pros as a niche counter, he hasn’t really had sustained success. Is he a marksman? A bruiser? A mid laner? The average player couldn’t make Urgot work, and his design hadn’t aged well. Even other recently reworked champions received in-game voice lines razzing him for being out of date, which has to be a kick to the ol’ confidence. Luckily, he’s returning to League of Legends with a gameplay and visual update that make him a little more forgiving in the 2017 version of League of Legends. The Urgot rework is surprising—not because it wasn’t badly needed, but because it’s less of a visual reimagining and more of a polishing of the same core concept. When Karma went under the rework knife, she emerged as a nearly completely different character, keeping only a couple of visual elements from her previous design. Urgot seemed ripe for such an overhaul, especially because he’s never been the most popular character, but Riot chose to double down instead. Urgot fans are likely going to be extremely pleased that their metal monstrosity is largely intact. Not only does he still have spider legs, but he has twice as many, and now they have shotguns in the knees. Instead of a stitched together belly, he has a torso that opens up and grinds enemies to death. Riot has continually struggled with bringing a new take to a character while not alienating fans of the original iteration. Karma was a controversial change, because her old fitted dress and fans were replaced with flowing cloths and glowing, spiritual light. Fiora’s new splash art depicted her as arrogant, sharply featured, and a departure from the rest of the female cast, but fans cried out and her new look was significantly toned down. Urgot could have been a chance for them to depart from his old identity, but instead all of the main elements are still there. He even retains his dual Noxus/Zaun identity, although this time he’s going for Grand General Swain and not Jarvan IV. His kit is substantially different, and here’s where it gets interesting. Urgot is a ranged take on the Juggernaut class, which is defined as a slow moving, hard hitting group of champions. Up until now, Juggernauts have been melee. Urgot’s ranged, but he’s not exactly a marksman. His passive is Echoing Flames. When you attack in the direction of his knees, the knee opens up and sprays out flame, dealing AOE damage. The leg then goes on cooldown. If you continue to proc Echoing Flames on the same target in a short window of time, the damage of each proc is lowered. Corrosive Charge is Urgot’s Q, and this is pretty much the same as his old kit. You throw out a little AOE charge that does damage and locks onto the target. Instead of throwing out a constant stream of blades at that locked on target, Urgot wants to rely on his W, Purge. Urgot shields himself and engages a target with a quick succession of shots, prioritizing locked on targets and procing Echoing Flames (assuming that leg is off cooldown). His E, Disdain, is another simple ability like his Q, but it has synergy with the rest of his kit. Disdain allows Urgot to charge forward. It’s a short distance, and it’s easily telegraphed, but it does give him some much needed mobility. If he collides with an enemy champion, he throws them over his other side and locks onto them. This kit is pretty straightforward, but Urgot’s ultimate, Fear Beyond Death, is jam packed with utility, damage, and straight-up horror. Urgot throws out a massive drill, and if it collides with a target, it does physical damage, locks onto them, and slows them. If the drill is still in the target and they fall beyond 30% health, Urgot can cast his ult again. This time, it locks him and the enemy champion into a special state. On the second cast of Fear Beyond Death, the enemy becomes untargetable. Urgot begins to reel them in, and the only way to stop that is to kill him. If Urgot brings the enemy champion in, he opens his guts, pulls out two sawblades, and executes them. If Urgot successfully grinds an enemy champion to dust, all enemies around him are terrified and flee the scene. If you go toe to toe against Urgot, you’re probably going to die. His kit is designed to dish out damage against melee champions and chase them down when they disengage. That being said, he’s not unbeatable, and in fact there are some very obvious strategies that should allow players to get around him. First, he has no built in sustain. If you’re playing, say, a Renekton or a Fiora, you just need to successfully avoid his E, walk away from an engagement, and heal up. By the time you duel again, you’ll be much healthier, and Urgot will still be feeling the effects of his last dance. There’s also another option: range. A character like Quinn or Jayce can leisurely avoid the fire from Echoing Flames, dodge the Corrosive Charge and plink away at Urgot. Add in the fact that he has long cooldowns in lane, and it’s going to be very easy to bully him. 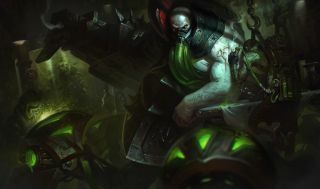 It’ll be interesting to see if Urgot manages to shine in pro play once he hits live, but this rework seems successful at reimagining the champion in a way that allows new players to pick him up. The fact that Riot has pleased the old Urgot mains as well seems to be a solid bonus. No longer will Urgot exists outside the current class system, not quite a bruiser and not quite a marksman. Hopefully, his strong new identity (and horrifyingly strong ultimate) allow him to finally shed his reputation as a bit of a joke.